Many of the Dy isotopes have been the subject of physics research. Dy-156 has been used to study double electron capture while Dy-160 has been used in research to investigate its multitude of excited states. Dy-161 spectroscopy has been used to determine the properties of Dy based superconductor material. Dy-162 has been used to study excited states in deformed nuclei. Dy-164 has two medical applications. It is used in the production of Dy-165 which is used in arthritis therapy. Dy-164 is also used for the production of Dy-166 which decays to Ho-166 and this used in cancer therapy. The Dy-164 to Ho-166 route gives the advantage of generating so-called carrier free material. This table shows information about naturally occuring isotopes, their atomic masses, their natural abundances, their nuclear spins, and their magnetic moments. Further data for radioisotopes (radioactive isotopes) of dysprosium are listed (including any which occur naturally) below. 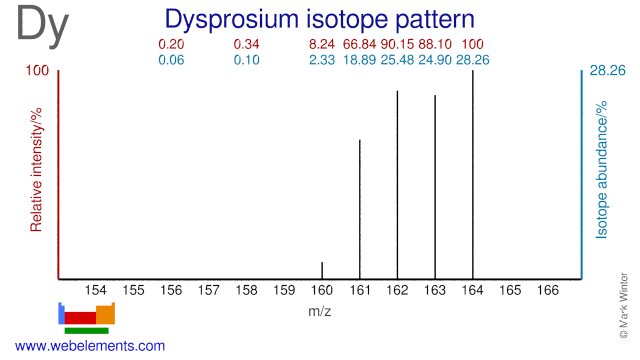 Isotope abundances of dysprosium. In the above, the most intense ion is set to 100% since this corresponds best to the output from a mass spectrometer. This is not to be confused with the relative percentage isotope abundances which totals 100% for all the naturally occurring isotopes. Further data for naturally occuring isotopes of dysprosium are listed above. This table gives information about some radiosotopes of dysprosium, their masses, their half-lives, their modes of decay, their nuclear spins, and their nuclear magnetic moments.